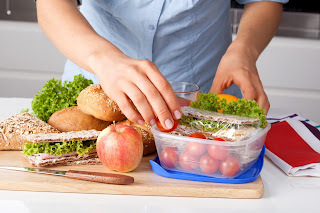 Although you may groan at the idea of making yet another sandwich, there’s a reason they are such a staple when it comes to on-the-go lunches. Sandwiches are not only quick and easy, but they have a perfect mix of everything that you may need for the day. No matter how boring it may seem, don’t overlook this option just yet. While the classic sandwich has the basics of ham/turkey, cheese, tomato and maybe some lettuce, you don’t have to limit your options. One of the best things about a sandwich is that almost anything between two slices of bread is considered one. This means that you can add anything from fresh avocados, pesto, arugula and even grilled chicken to your sandwich. Sounds a little bit better than a plain peanut butter and jelly, right? If you don’t think a sandwich is enough to fill you up, you can pair it with a good ol’ bag of chips. Although some potato chips are unhealthy, there are others out there that aren’t too bad for you. Our protein chips are an excellent way to add a little crunch to your lunch without unnecessary calories. These chips are packed with protein and fiber to fill you up without all the added sugar and fat. Ever heard of breakfast for dinner? Well breakfast for lunch can also be a great option. Since breakfast is known to be the most important meal of the day, some of the healthiest foods can be breakfast foods. They are meant to start your day off with just the right amount of energy you need to get through the day. One of the easiest breakfast foods to make is an omelette. We know it probably isn’t the first thing you think of when you think of something “quick”; however, making an omelette is a lot easier than you think. With our bacon and cheese omelette, you’ll only need to add water and whatever veggies you like for a complete, filling meal that can be heated in a skillet or in the microwave. Never underestimate the magic of a nutritious liquid lunch. Whether your preference is a chocolate shake or a strawberry-banana smoothie, you’ll appreciate a filling drink to keep you going for the rest of the day when you’re on the move and don’t have time to sit down. These go perfectly paired with a protein bar – throw it in your bag before heading out in the morning to enjoy whenever a pang of hunger hits. When you think of microwave meals, you’re probably thinking that there’s no way they could be healthy or tasty. However, there are many delicious, healthy options out there, like our vegetarian chili with beans, macaroni and cheese or even a nice spaghettini. Although it may be hard to believe, these microwave meals are a great way to get a complete meal in a matter of a few minutes. Plus, the high protein content will keep your hunger at bay throughout the afternoon. When it comes to health, making the right choices about what you put into your body is essential to keeping you not only energized but also happy. While skipping a healthy meal is okay once in a while, it should be an exception, not a rule. Preparing or planning your meals the night before is a great way to make sure you have quality, easy lunches ready to go – and doing so will save you time getting out the door. Browse through our wide range of options here for some inspiration!